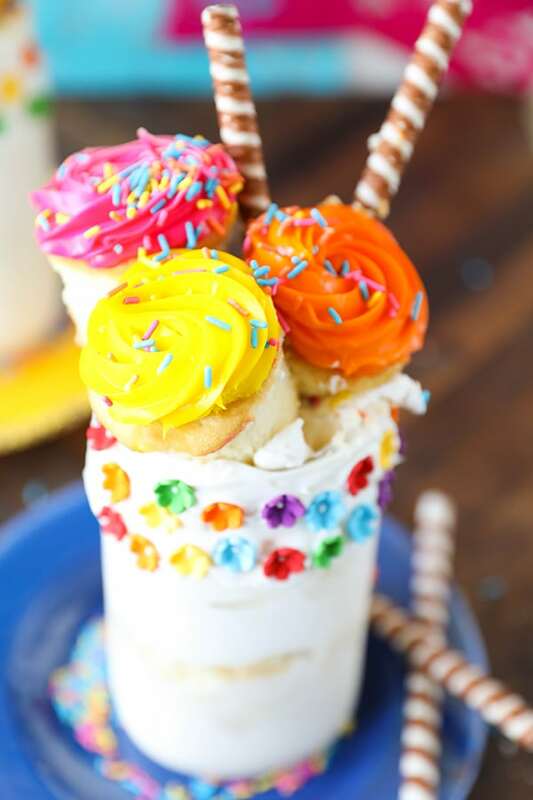 This Coco Freakshake, is an over-the-top milkshake inspired by the Disney Pixar Movie, Coco. A delicious Tres Leches Cake Milkshake, with the traditional 3 milks plus whipped cream and real cake crumbles. 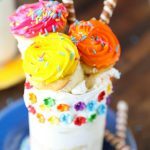 Then, this freakshake is loaded with colorful Coco inspired cupcakes and sprinkles. With Pixar Fest happening in Disneyland, and Pixar Pier opening this summer, not to mention Toy Story Land opening at Walt Disney World very soon, we are in the mood to celebrate all things Pixar. This mega milkshake is inspired by the beautiful colors in one of our favorite Pixar movies, Coco. I started with a fun Tres Leches spin on a milkshake. Vanilla ice cream is blended with real cake crumbles, I used store bought cupcakes to save time, as well as the traditional, heavy cream, evaporated milk and sweetened condensed milk. If you love Pixar, don’t miss my Disneyland Pixar Fest Food finds here. In a blender, combine ice cream, heavy cream, evaporated milk, sweetened condensed milk, vanilla and 1 cup of cake crumbles. Spread frosting along top of mason jar and press in flower sprinkles. 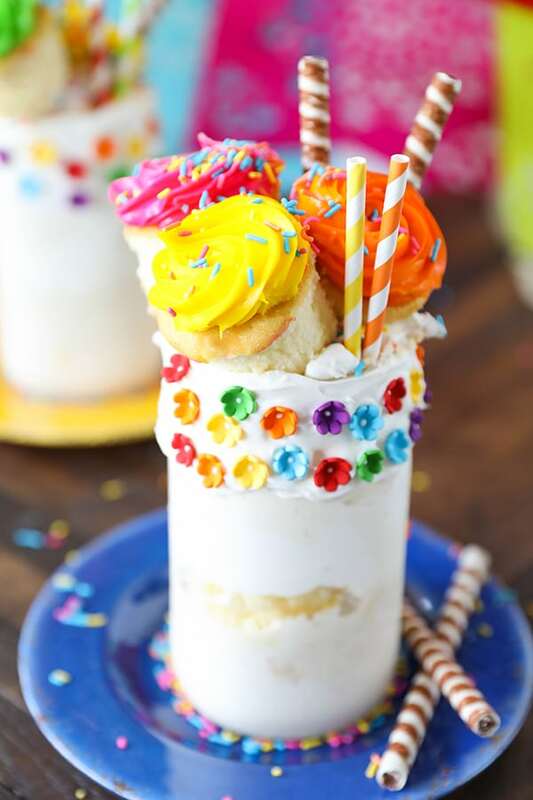 Fill mason jar with milkshake, whipped cream and remaining cake crumbles. 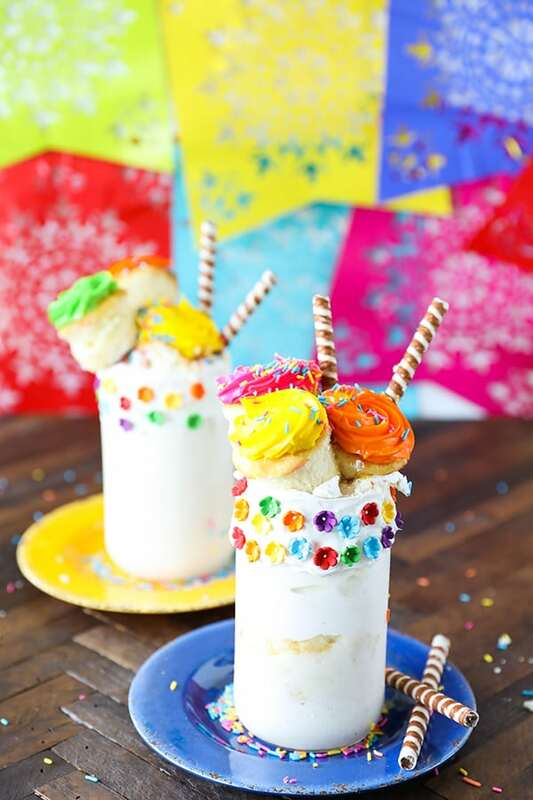 Top milkshake with cupcakes, using straws for support and finish with additional whipped cream and sprinkles. 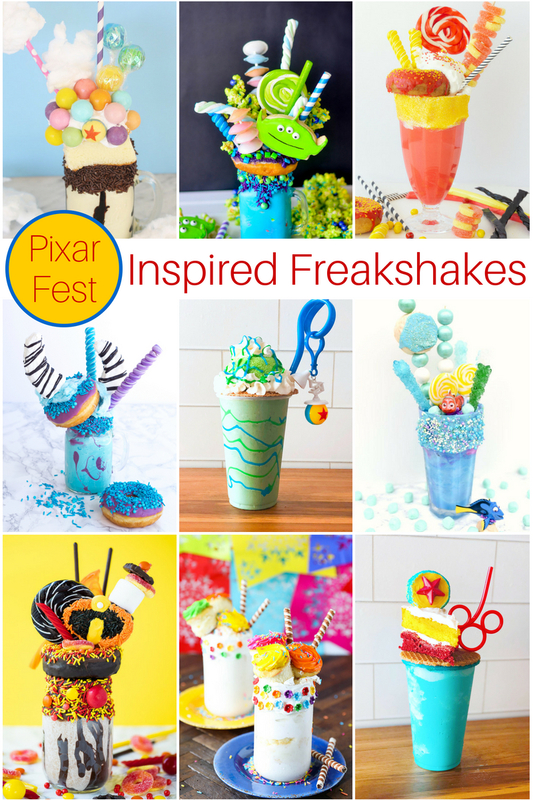 My Disney loving friends are sharing some awesome Pixar Fest inspired freakshakes too. Check out how fun they all turned out! I love the bright colors! Totally screams Coco! omg, the kiddos and I have to try this but I feel like just one will be enough for all of us. This will be a fun treat to try and watch Coco with!